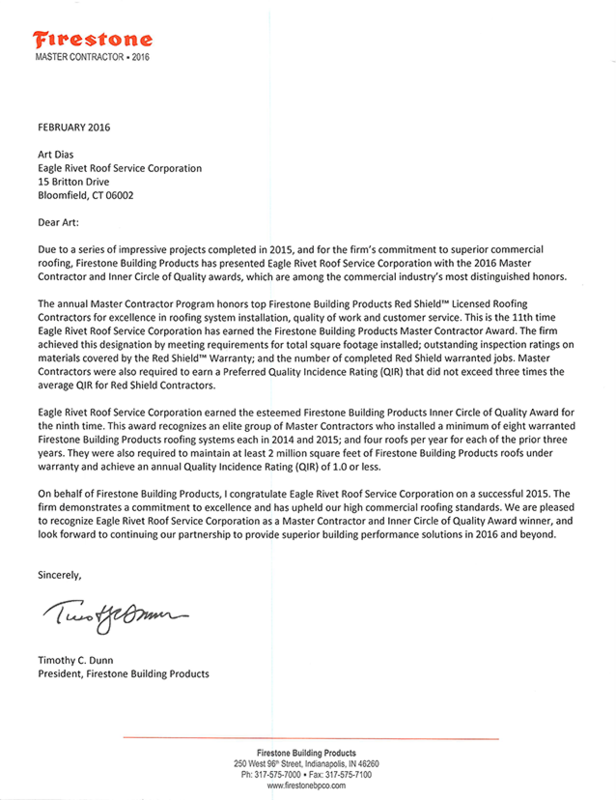 Eagle Rivet is pleased to announce that in 2016, we have once again been recognized as a Firestone Master Contractor – our 11th time total! The award is issued to contractors who have installed and maintained a certain number of high-quality roofs and roof systems using Firestone products in the previous year. Due to the Eagle Rivet commitment to excellent workmanship in every project, and the use of industry-leading products for every job, we rely on Firestone to deliver waterproofing, weatherproofing and longevity performance every time. We are happy that our commitment has been recognized with this cherished award. Firestone is all about making your job easier—about being the company you can count on for every building performance solution you’re looking for, from roots to rooftops. They believe you shouldn’t have to go it alone when taking on a building project. They make it simple to find the right materials for your building needs: from offering support services and warranty to providing exceptionally performing building materials. Being world recognized for 100 years, you can rely on Firestone to help you see the big picture you’d like to achieve.